Firehouse Innovations Corp. - The training prop used here at 10-75 Training, LLC. 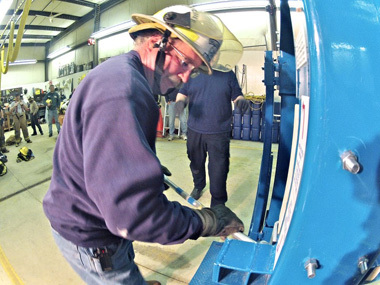 Fire Hooks Unlimited - Manufacturer and distributor of all types of forcible entry and firefighting tools. Fire Tech and Safety of New England - My local fire store. Fantastic group of guys with amazing customer service and prices. Fire Axes - Incredible quality axes made by an LA Firefighter. The Official axe of 10-75 Training, LLC. Save A Jake - All sorts of nylon and leather items for the fire and EMS world. All hand made by a full time Firefighter in Florida. His leather radio straps are the best. All Hands Fire - In my opinion, the best online firefighting supply store in the US. Excellent customer service, huge selection and great prices. Owned and operated by a NJ Firefighter who is always ready to answer any questions you might have. Aazel Corp. - Manufacturers of the Monster Halligan. Features all the upgrades most departments make to their standard Halligan plus a 4" wide Adze. We bring one to all our classes so you can compare them to a standard Halligan. Vent Enter Search - A great resource for valuable tips and tricks. Urbanfirefighter.com - Home of Urban Firefighter magazine. Lots of great info and articles. Firefighter Close Calls - Excellent source for fire related news and safety alerts. Fire Rescue 1 - Yet another great source for fire related news. Boston Fire Gear - Online store for Boston FD wearables.